“Let’s start from the very beginning. A very good place to start…” (Of course I’ll be throwing in cheesy song lyrics and music references, so be prepared!) In the fall of 2009, I was enrolled as a music management major at William Paterson University. After a year, I learned that the most important thing about the music industry today is that you just have to simply immerse yourself in it. You don’t necessarily need a “Music Business” degree to get hired in the music industry, so I decided to expand my options. I became a music education major with a concentration on classical violin and a minor in music management. 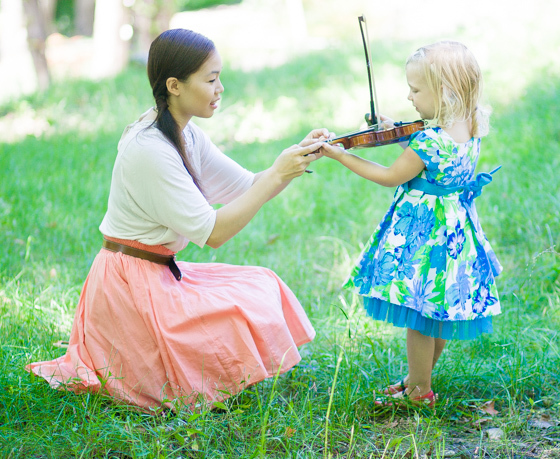 While I am originally from Connecticut, I currently teach private violin, viola, cello, and piano lessons at the Olive Tree Music Academy in New Jersey. During the summer I travel across the nation to various Suzuki Institutes and teach violin, music history, and my very own boom whackers ensemble. I formerly worked as a Program Aid for “Little Kids Rock,” a non-profit organization dedicated to teaching instrumental music in hundreds of public schools across the country. At Little Kids Rock, I helped research, create and distribute curriculum that is used by over 100,000 students nation-wide. I have also worked with the New York Grand Opera along side the founder, and esteemed Juilliard professor, Vincent La Selva. Additionally, I have studied violin with the late Cynthia Prentice, Claudia Tondi, Franco Gennarelli, and jazz violinist Scott Tixier. While I was in college, I was the concertmaster for the William Paterson University Orchestra under the direction of Sandra Dackow and I was also a guest violin soloist with flautist Sir James Galway and Tim Janis at The Salvation Army’s 66th Annual Gala at the Marriott Marquis in Times Square, New York City. So back to where we started; the only way I was able to achieve these amazing opportunities was through my combined knowledge of both music worlds. I’ll explain the importance of business in the education side and vice versa. Some posts may just be music business related, or cute/horror stories in my day-to-day teaching life. Or both! I guess you’ll just have to stay in tune (chuckles) and find out. I am now placed in the unique position where I am passionately devoted to two sides of an industry that I am eager to be apart of. My ultimate goal is to combine these talents in a way that brings together my love for teaching and spreading music, and my interest in the behind-the-scenes business aspect of the industry.